Okay, so we’re not sure why the news didn’t announce this first thing this morning. Today, March 6th, is National Oreo Day. Oreo is 106 years old today, but, in our opinion, doesn’t look a day over 30. If we would have known, we would have thrown you a party, Oreo! To celebrate its ripe old age, Oreo is giving away free candy bars to lucky Oreo-lovers. Yeah, that’s right — free Oreo candy bars. Here’s how you can get one so you can be a part of Oreo’s birthday magic. Firstly, you have to love Oreos. There’s no point in winning a free Oreo candy bar if you’re not going to eat it. Secondly, you’ll need to have access to the Oreo Chocolate Bar Giveaway webpage. Here is where you can register to receive your free candy bar. 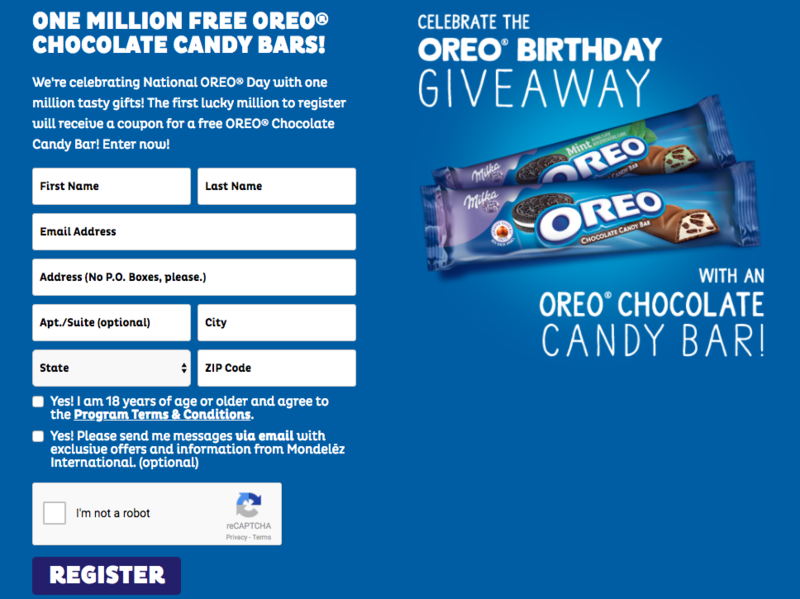 Please note: Oreo is only giving away chocolate bars to the first one million registrants. Act quickly because it’s now or never, people. You’ll need to give Oreo your name, address, and email in order to be entered into the giveaway. Then confirm you’re not a robot and submit. Hopefully, if you’re within the first one million, you’ll be on your way to getting a sweet treat in the mail soon enough. Listen, it doesn’t matter how long it took you to emerge. We’re just glad you’re here now. Yes, Oreo does have a candy bar. It’s a Milka chocolate bar packed with crunchy bits of Oreo cookie and rich creme filling. The Oreo chocolate bar is an entirely new way to enjoy the classic cookie. It's #NationalOreoDay and we have something to settle. What's the BEST way to eat an Oreo? And hey, if you don’t win one of the free Oreo candy bars, there’s plenty of other ways to celebrate such a monumental day. Buy a package of your favorite Oreos and let the milk dunking/twisting open/biting whole eating ritual commence. HBD, Oreo!